I'm going to try and do a tutorial of this. I think I have only done one other tutorial in my blogging life. I have to show you this cute pumpkin made out of a roll of toilet paper. I was shown this when I went to get my 3rd block for the block of the month that I'm doing. Here are the materials that you will need. Scrap Batting...I cut the batting just a bit smaller than the fat quarter. Silk Leaves "to dress it up". Lay out the fat quarter and lay the scrap batting on top. 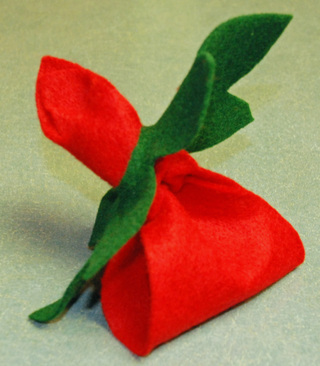 Place the roll of toilet paper in the middle then wrap the fabric and batting around the roll and tuck it down in the middle of the roll. It should look like this when it is done. I folded the paper bag in half so that the stem would be a bit shorter and I twisted it. Then you stick the stem in the middle of the roll of toilet paper. 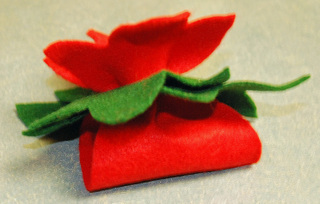 You then add the silk leaves to dress it up. I added real leaves from my yard as I didn't have any silk ones on hand. I'll keep the real ones in until they dry up and don't look as nice. Aren't they cute? They are too easy and quick to make. I ended up making 4 of them, I thought they were just darling to decorate my home with. How's that for a tutorial? If you end up making any let me know so I can see yours if you have a blog. We had a really nice weekend and there is so much to show you, so stay tuned. We are supposed to be getting our wood stove installed today...bring on the cold weather. These are very fun to make. You can use felt like I did or fleece. The middle insert is just a tassel that you can buy at any fabric store. You just tuck it in the middle. I really don't suggest tacking or gluing it in, as you would want to take the napkin holder apart to store them for the next year, but you don't have to, you could just keep them together. 11 1/2 " long, and 3 1/4" wide at the widest part of the flower petals, and 3" wide at the middle. 6 3/4" long and 4 1/4" wide at the widest part of the leaves, and 2 1/4" in the middle. 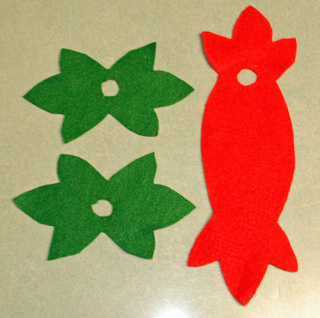 Cut 2 green leaves and 1 red flower with a hole in the middle of each green leaf and 1 hole in the red flower. Make the hole size just big enough to be able to put the felt through. I hope this all makes sense to you. 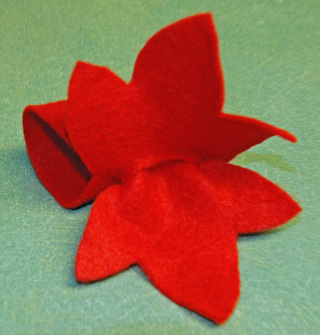 Take the red "flower" end and slip it through the hole to make a tube and two flower petals. Take the green leaves and slip both of the red "flower" ends through the center hole in the green leaves. Take the other green leave and do the same as you did the first one. 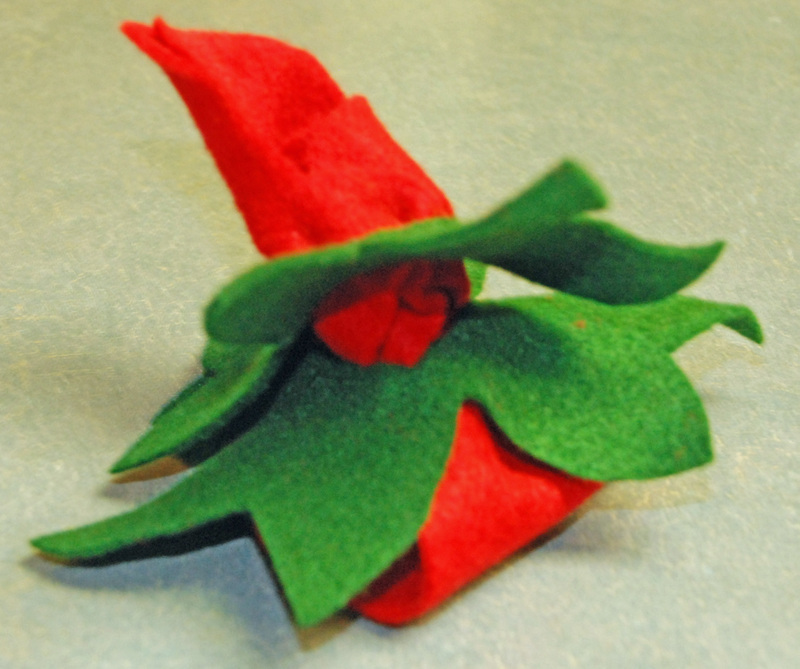 Stagger the green leaves so that you can see all the leaves, fluff out the red flower petals. You can add a tassel to the middle for an added look. I just stuck it in and did not glue it so that I could take it apart and store it for future use.